Even though our casual shortening of 7 Days on the Internet to '7doti' failed to click with my fellow staff, I'm going to labour on under the assumption that our readers are infinitely cooler than all the people in the office and flog this dead horse for all its worth. So welcome to 7doti – your round-up of the web of our wide world, browsing casually into the corners of your minds to bring you the hottest, coolest, longest and possibly cuddliest news, views and, for one week only, mews. Let's start with the story hot off the press (our printer broke) on Google's 'zeitgeist' which any German GCSE student will tell you means time ghost. So, oh ghost of time, what exactly has the UK searched for on Google in 2008? Apparently it's 'Facebook' and 'BBC'. Now we know what you cunning people are doing here – you know darn well that facebook.com in the URL bar would take you to the page, but those extra four characters are completely pointless when you have Google as your homepage. Not for you the drudgery of typing out web addresses! Not for you the 12 yard stare at the keyboard as you seek the :// to http you to your destination. Google – we salute you and your capacity to save us all from unnecessary effort. Now .net is a magazine that is close to our hearts (and just so we are VERY CLEAR published by the same people as TechRadar) – so we were delighted to do a news piece on their picks for the best of the web 08. However, I do think that picking out Rick Astley as web personality of the year is highly contentious – I mean he's just the front man of a long-standing internet joke which he didn't invent and doesn't really understand. And if that's the criteria then surely Yahoo's Jerry Yang should have picked up the prize. Zing! We also learned this week that the entire reason Blur got back together was a retrospective of their best times on YouTube. Of course, these times include cockney chirpiness with Phil Daniels, running round a Country House with Jo Guest and taking on Oasis in the battle of BritPop. I'd be speculating when I suggest that what might be more accurate is that the band members looked back at their more recent post-Blur stuff and realised that a collaboration with Betty Boo, the one good Gorillaz song and that freakin' song from the adverts suggests that they were better together. Finally, in our 7doti (it's going to catch on – I promise) news round-up is the story that Virgin's Alex Green thinks that Web 3.0 will be here by 2011. Which is great unless you're one of the (sane) people who think that Web 2.0 was a load of marketing guff in the first place and any mention of Web 3.0 should immediately devalue all other comments made. "My problem with it is that, although it will probably happen in the future, I can't deliver it reliably to the majority of people so I would risk falling on my arse," said Sky's Griff Parry on why there is no HD option in the new Sky Player TV service. Toslink – I was disappointed to find out that this was not a pr0n rickroll, but actually an audio connector. 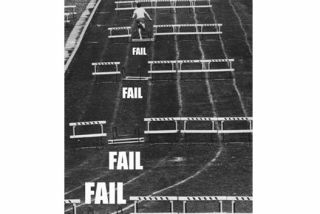 Fail! It's a term that has only just started to get the mainstream coverage that it deserves, and the blog of fail is one of those 'just one more' sites that leaves you flitting between laughing and forwarding on links to your mates. A repository of the best comments from IRC channels everywhere. Still vastly amusing even if you aren't too au fait with the rigours of internet relay chat. Geek wit ftw! We like bitterness – and we're not sure if that's because we are cynical hacks or because someone's rants against pretty much everything are funny. This blog is as bitter as they come. Look, we know that funny cat pictures and 'lolspeak' isn't everyone's bag, but LOLcats is another blog with a unique capacity to keep you browsing long beyond the times you ought to. Internet meme at its best. Objects with faces is great, but idiottoys really shines when it gets its hands on 'lifestyle' photographs from the Far East. Cynical and highly amusing. Unbelievable. I sent that Vermeer COMPLETELY by accident. Was showing someone how pants the BB Storm is. In pocket. Sent by nut pressure? Just done Richard & Judy. On my way home. Have momentous announcement to make. *clears throat* I'm gay. No, that's not it. Await next tweet.